Celebrate Earth Day weekend with 30Boltwood at The Lord Jeffery Inn in downtown Amherst! Chef Kevin Doubleday and his team have put together a special menu for the benefit of the Hitchcock Center, featuring seasonally sourced, vegetarian and non-vegetarian selections from our local farms. A portion of the proceeds from this delicious three-course prix fixe menu will benefit the Hitchcock Center. 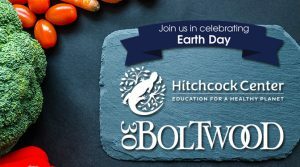 Along with the Hitchcock Center, 30Boltwood shares the deep commitment to the environment and remains dedicated to sourcing from local purveyors and supporting local farmers. This special menu affords us the opportunity to showcase the abundance of seasonal produce and proteins available to us in the Pioneer Valley. 30Boltwood’s environmental commitment extends beyond the plate and into the physical plant. The local farms that are featured in our 2018 Earth Day menu are: Old Friends Farm (Amherst, MA), The Kitchen Garden (Sunderland, MA), Maple Hill Farm (Hardwick, MA), Berkshore Local Fish Monger (Easthampton, MA). As a LEED Silver certified building, The Lord Jeffery Inn is one of the greenest businesses in the Pioneer Valley, having also earned the 2014 Sustainability Champion Award from Historic Hotels of America. Using a geothermal ground source heating and cooling system, water-efficient landscaping, energy efficient plumbing and electrical fixtures, regionally manufactured and recycled content materials, and CO2 fresh air activated systems in all of their meeting rooms, “The Jeff” and 30Boltwood share many of the sustainability measures implemented in the new Hitchcock Center. We are excited to partner with the Hitchcock Center to pair our contemporary, locally sourced farm-to-table menu with Hitchcock Center’s world-class environmental education center and programming that serves over 10,000 children, youths and adults each year. Please join us for a delicious full-service dining experience and help support environmental education for people of all ages and abilities!